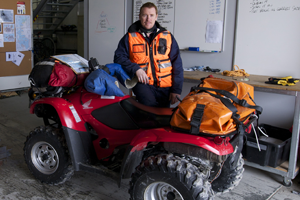 With close to two decades working at the Australian Antarctic Division (AAD), Charles Sturt University Alumnus Chris Gallagher has looked after people’s safety in what has to be one of the most untouched, extreme environments on earth – Antarctica. Charged with advancing Australia’s strategic, scientific, environmental and economic interests in Antarctica and the Southern Ocean, the AAD is headquartered in Tasmania and this is where Chris lives with his wife and two children. A former carpenter, Chris first gained a degree in Parks, Recreation and Heritage and is now completing his Master of Emergency Management, which he will put to excellent use in his role with the AAD. It’s a good thing for Chris that he loves the cold! Here Chris tells of the great things to come from studying at CSU, the best of which was meeting his wife, Georgie. At school I...went to Marist College in ACT. The highlight was their outdoor education program. It was way ahead of its time - before outdoor education was cool. It led to me working at Outward-Bound and onto the carpentry trade, and then to university. My childhood was...fun. I was a quiet and shy kid, but I loved wondering around in the outdoors. I left home early and got home late. I lived in Chapman, ACT, which backed on to the Murrumbidgee River. My friends and I used to go there a lot, and I walked and fished most of the river from Kosciusko to Cotter Dam when I was at school. I also walked several times from Kosciusko to Chapman; it was great place to live and explore. I chose CSU because …of the correspondence study program. My degree took six years and my Masters has taken two years, and I have done all of my study while working full-time. It has been fantastic and I would highly recommend CSU for distance education students. The support, especially for my Masters, with the dramas of two young kids, has been outstanding. My best experience at CSU...was meeting my wife. This continues to be the best experience of my life! We met in 2002 at the Albury campus. She was a dead ringer for Demi Moore and was doing the same degree as me. In 2004 we did a university exchange with Lake Head University in Thunder Bay, Canada; it was great to do it together. My worst experience at CSU...Statistics! 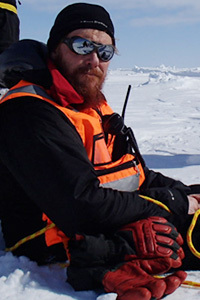 I was lucky...to start my work in Antarctica in my early 20s. I have seen a lot of change and have been able to influence change it a positive way. 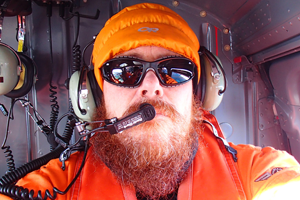 I have a good understanding and knowledge of Antarctic operations and I just love the cold - I have ice in my veins. I recently...took a promotion and now work as an Architectural Services Supervisor and Safety/Environment Project Officer. At the moment I am writing the Confined Space Entry Management Plan for the Australian Antarctic Division and also supervise carpenters when they work in Antarctica. In my profession it is important to…measure twice cut once. It’s a chippy term, but I apply it to my work all the time. Look at the situation and picture the possible different outcomes of the situation, and then double check the plan, and ensure you have the capability to be able to change it if needed. I never dreamed I would…be able to go to uni when I was at school. My greatest achievement is...finally believing in myself. I was a slow learner. In the future I’d like to … Keep it simple, be happy and healthy so I can continue to support my family. I have no future without them.